Cause loss of food sources and habitat for wildlife. Provide shelter for feral animals that prey on native wildlife. Change soil or water nutrient loads, affecting native plant growth. Alter fire intensity and frequency, which in turn affects native plants and animals. Disrupt water flow patterns and cause erosion. Many weeds begin as garden plants. Be aware when buying garden plants that some species can spread into the bush. African boxthorn (Lycium ferocissimum), Aleppo pine (Pinus halepensis), Blackberry (Rubus fruticosus), Boneseed (Chrysanthemoides monilifera subsp. Monilifera), Bridal creeper (Asparagus asparagoides), Buckthorn (Rhamnus), Bulbil watsonia (Watsonia meriana var. bulbillifera), Buffel grass (Cenchrus ciliaris), Cape broom (Genista monspessullana), Cape tulip (Moraea flaccida and Moraea miniata), Desert ash (Fraxinus angustifolia subsp. Angustifolia), Dog rose (Rosa canina), Fountain grass (Pennisetum setaceum), Gazania (Gazania spp. ), Gorse (Ulex europaeus), Hawthorn (Crataegus monogyna), Mirror bush (Coprosma repens), Native bluebell (Billardiera fusiformis), Olives (Olea europaea ), Polygala (Polygala myrtifolia),, Pussytail grass (Pentaschistis pallida), Sweet pittosporum (Pittosporum undulatum), and Willow (Salix spp). How do native plants become weeds? Most of our weeds are introduced from overseas, but some are Australian native plants that are growing outside of their natural or pre-European range. 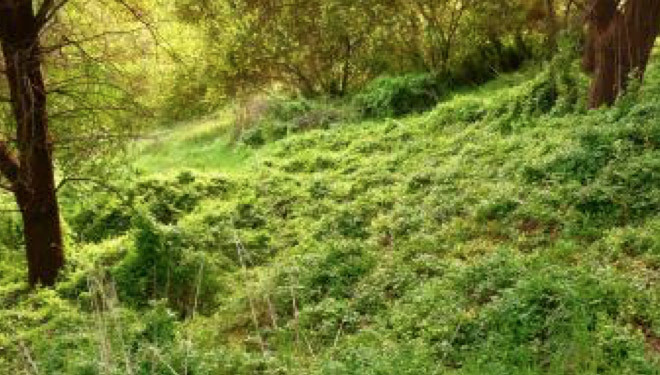 Just like their exotic counterparts, these plants become weedy when they encounter a new environment that lacks the usual herbivores, fungal diseases, insects or climatic constraints that keep them in check. Many of these have escaped from gardens, but some have spread from ill-conceived revegetation projects, such as windbreaks or shelter belts. In SA the most common group of natives to go weedy is the wattles, but also Hakeas, Grevilleas and Eucalypts. 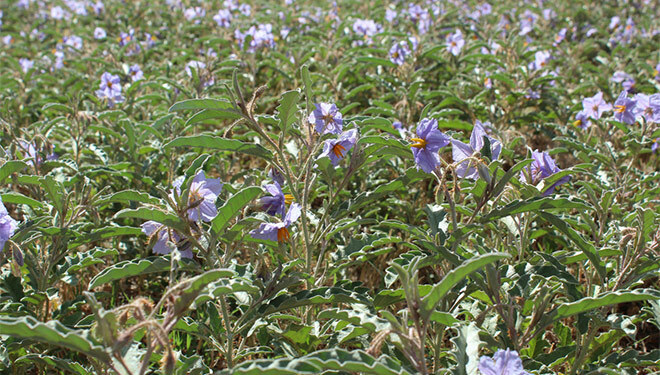 Field cropping, horticulture, and livestock grazing are all affected by weeds. Weeds reduce the quantity and quality of agricultural products. They affect quantity through yield loss due to competition, and by acting as alternate hosts to pathogens, viruses and insect pests. Weed presence can lead to increased effort needed during harvesting and indirectly cause crop damage through the application of control activities. Quality of agricultural commodities is affected by smaller size, poorer appearance and contamination of crops, and through poisoning or injury to livestock. Annual ryegrass (Lolium rigidum), barley grasses (Hordeum species), brome (Bromus species), Capeweed (Arctotheca calendula), Flaxleaf fleabane (Conyza bonariensis), Salvation Jane or Paterson’s curse (Echium plantagineum), Silvergrass (Vulpia species), Silverleaf nightshade (Solanum elaeagnifolium), Thistles (Carduus spp. ), Turnip weed (Rapistrum rugosum), Wild oats (Avena fatua), and Wild radish (Raphanus raphanistrum). The Weeds CRC has published a summary of economic impact of weeds in Australia. They estimate that the annual cost of weeds to Australian agriculture exceeds $3.4 billion. The main two impacts are yield losses and costs of control to the farmer. These costs are felt across the whole community, with primary producers bearing 81.4% of the costs and consumers bearing 18.6%. How are agricultural weeds managed? The best approach for long-term management of weeds is to take an integrated approach utilising several different methods. Management of weeds involves the careful selection of control methods that balance the costs and benefits of their uses for the particular agricultural system they are to be employed in. Herbicides have been the major weapon against weeds since the 1950s and are usually the first to be employed. Different herbicides can be used at all stages during the lifecycle of weeds: beginning with inhibiting germination, controlling young seedlings and mature plants, and also applying herbicides at flowering to reduce weed seed set. In field cropping in particular, the intensive use of herbicides coupled with high weed density have led to herbicide resistance developing in many weed species. With the increasing adoption of no-till farming in South Australia these systems are increasingly reliant upon herbicides for weed control, as most no-till producers have abandoned the primary weed control method of cultivation to conserve soil health. Herbicide resistance is also a problem in horticulture where herbicides are often the only means of weed control used e.g. under grapevines and in orchards. The increasing resistance to the widely-used herbicide glyphosate is particularly concerning. Cultivation is very effective for stimulating emergence of weed seedlings which can then be controlled, and this is a tool employed in many horticultural and cropping situations that have not converted to no-till. Other physical methods of weed control include burning and physical cutting of the plants prior to seed set. Crop and pasture rotation is an important tool for disrupting weed lifecycles and allowing for more diversity in the types of control methods used. Farm biosecurity is an important step in preventing the spread of weeds to new locations. Weeds in agriculture are often the symptom of a larger problem, and attention to adequate soil nutrition and health, soil seed reserves of desirable plants and water supply will suppress weeds through increased competition.